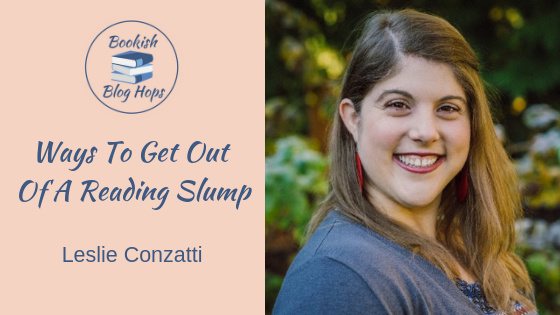 Welcome back for another stop on the BOOkish Blog Hop! I hope you've been following the blog hop so far and enjoying all the bookish posts. Missed a few? No problem! Just scroll down to the bottom of this post to find the full tour schedule for the month. I had a bit of a slump over the summer break. I’d had all these plans to read loads during the summer but then, when it came down to it, I was too busy, tired, or just not in the mood. By the end of the summer I was in a slump. One thing that helped a lot was to go back over my TBR to refresh my memory about the books I have in my collection that are waiting for me to read them. Next was to pick a book I wanted to read, and not just because I had been sent a copy for review. Sometimes it’s nice to read a book just for the pleasure of reading it. No pressure, just relaxing reading. Finally I decided to take part in a readathon. I found out about DEARathon (Drop Everything and Read!) and thought it was perfect for me. No challenges or restrictions on what or how much you read. The only goal was to read as much as you could during the readathon. They also did the most entertaining reading sprints I’ve yet to come across via their Twitter profile. I'm doing another readathon at the moment called BYOBthon (you can see my progress report for week 1 here). Even with this readathon I'm reading books I want to read. Yes the readathon does have specific challenges, but that doesn't mean you can't work around them to make your TBR fit. For example, one of the challenges of BYOBthon is to read a book from a series. I chose to read Percy Jackson and the Battle of the Labyrinth. Another challenge is to read a thriller. As I have loads of thrillers on my TBR this wasn't a problem either. In fact, I'm reading Fade to Black which has been on my Net Galley TBR for way too long. You see, you can use the readathon to inspire and motivate you to read more books that are already on your TBR list. It just means you get to connect more with the book community and have more fun whilst you do it. After six months of prescribed reading that was gradually less and less according to my tastes in college, I hit a reading slump hard. I didn’t have the motivation to read a single word--and for a professed book enthusiast like me, someone who has been poring over books since she first learned how to read, this was a truly terrible feeling, this apathy toward reading. For one whole month I didn’t read a single book. I watched movies and tv shows, but I didn’t do any reading. Finally, after several weeks, I encountered a copy of Ray Bradbury’s Fahrenheit 451. I knew of it, I knew the general premise--having come across it mentioned in various iterations of American Literature courses I had taken--but I had never actually read it, so, out of boredom and mere curiosity, I did. By the end of it, my passion for literature had returned. Not just with the quote I often cite as my core motivation, “Good writers touch life often. The mediocre ones run a quick hand over her. The bad ones ravage her and leave her for the flies.” Additionally, it was the way that a story about a society intent on eradicating books was itself littered with quotes from obscure classic literature, now immortalized in this book about how books are dangerous and subversive and mankind ought to outgrow his dependence on them. I haven’t had a really bad book slump since. Most of the time, what helps is to diversify my media intake: I watch movies or TV shows rather than read, but I find that it still stimulates my imagination and creativity in much the same way. Sure, my energy level is frequently low when I’m working full time, or I need to prioritize other things than taking the time to sit and read a book, but I have found that the more I read and take recommendations from others, the less likely it is that I will ever leave the library empty-handed, and the more books I am constantly adding to my “TBR list.” The more I read, the longer it gets, and the more I am convinced that I will never see the end of it. And that’s all right with me! Last month, I couldn’t finish anything. I’d pick up a book and put it down, uninspired. I think I was just trying to read books that didn’t sing to me. One top tip is to ask friends and family for recommendations. Usually, if they are people who are interested in similar books to you, they will come up with great choices. The books might be ones that you would not automatically pick for yourself. Also, the drive to then discuss the book with them afterwards will keep you reading until the end. I found The 100-Year-Old-Man Who Jumped Out of The Window and Ran Away which is a delightful book and How To Be Both by Ali Smith in this way. Also buying or borrowing a ‘real book’ rather than an ebook is normally inspiring for me. If the book is from the library, it has a due date which provides a kick in the pants. And you really can’t beat that real book smell. Also, you can read paper books in a nice sunny spot, without the glare of the screen. I have been an avid reader since childhood. Until about two years ago I had never had a reading slump. Reading had accompanied me through everything and had been my escape. Then I started to have numerous health issues and as the symptoms I was experiencing increased I started to suffer with cognitive issues. Mainly brain fog, forgetfulness and the inability to focus for long periods of time. Slowly I stopped reading in fact that slowly I hadn’t noticed. When I realised that I had literally stopped reading and hadn’t read anything outside of the odd facebook post in over a year, I had a bit of an identity crisis. With everything else my illness had taken from me I couldn’t believe I had lost my escape. I was more than a little frustrated at both myself and my health issues but at the same time determined to change things round. What helped me to get out of this slump was my partner literally shoving a copy of Guards! Guards! by Terry Pratchett as he knew I loved both fantasy and comedy. It took me at the time what felt like forever to finish it. Each day my partner had something else for me to read a news article, a comic, a blog post, something he needed me to proof read. Slowly my reading ability began to increase. I found I was feeling more relaxed and happier. 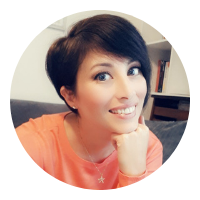 Having had to stop work due to my illness I decided to start blogging. In an early post where I wrote about this subject further Changing Reading Habits I casually mentioned possibly book reviewing. By the end of the day I had been asked to review two books. By the end of that week I had joined a heap of book blogging and book tour groups and since then I have been reviewing 2-3 books a week. I am loving reviewing books for the blog and enjoy doing a mix of book tours and reviews. The tours are great as I am reading to a deadline and so even if I don’t feel in the ‘mood’ to read that will push me into having to. They also open me up to new new and different books that are being released meaning that my TBR list is now neverending. Which is ok, isn’t it? How do you pull yourself out of a reading slump when it hits? Want to join in with future blog hops organised via the Bookish Blog Hops group? School holidays? Already? I only just got my kids back to school for the new term. Hope you manage to find some time to relax and read a bit. Great that you don't usually have reading slumps. Trying something new can be a good way to avoid them. I always tend to hit a reading slump after I read something great, like a book hangover - I may need to try some of this advice. Ah yes, book hangovers. I know exactly what you mean. When you get really invested in an amazing book it can be hard to move on afterwards and result in a reading slump. Readathons are so much fun. It's important to find the right type of readathon to suit you though so you don't feel stressed out over the challenges. Great! Thanks Christina. I'm glad you liked it. I tend to reread a favourite book to get me out of a slump or see what's new by my favoured authors and buy one of those. I don't get many reading slumps because if I don't want to read a book, I will revert to listening to one. Listening to an audiobook can be a great way to overcome a reading slump. Mixing things up a bit when you can't sit down and read a printed version could be just the thing to beat the slump. There are loads of readathons happening throughout the year so it's easy yo find one to suit your reading tastes and the level of challenges that work best for you. Worth checking out. Rereading a favourite book is a popular way of beating a reading slump. It's a bit like a literary comfort blanket. I sometimes get into a slump when I am reading a book that I have lost enthusiasm for. If that happens I don't usually like to leave it and not finish it, so I get a bit stuck trying to slog on through! Then I find it helps to read another book and then come back to the first one! Great tips here, thanks! Ah yes, to DNF or not DNF that is the question. I'm like you and tend to stick it out in the hopes that the book gets better. Taking a break and coming back to it can do wonders. I'm currently in a reading slump. Thanks for the tips! Oh no! 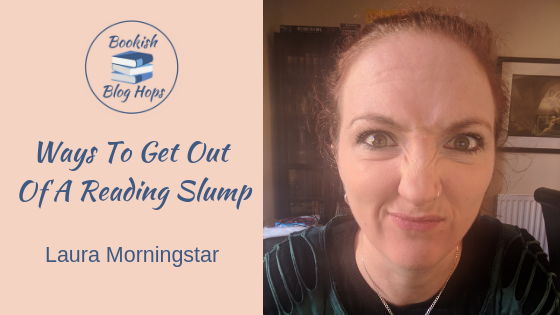 Hope this post helps you overcome your reading slump Jenn. 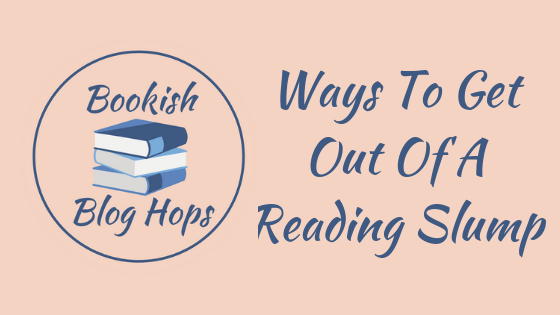 Switching genres is a great way to keep things interesting and avoid a reading slump. After several years of reading very little in my early twenties I overcame that years-long slump when I moved from literary novels first to Fantasy and then to Romance. For me, it was really that I needed to find my genre. Trying new genres can open a whole new reading world. I've never done a readathon. I'm glad you found one that works for you! There are loads of readathons out there. I personally tend to take part in the low key ones like DEARathon and BYOBthon. My only big readathon with more demanding challenges is Booktubeathon. I really enjoy readathons. If I do have a reading slump I usually go for something light and fluffy and easy to read. An nice quick easy read (usually romance or chick-lit for me) is usually my go to in these cases too. Book series can be great for keeping you reading. It's easier to drive into the next book when you've been following the whole series. I hit a reading slump recently. Fortunately came out of it. I'll try out the suggestions, next time, I hit a slump. Glad you managed to get out of your slump. 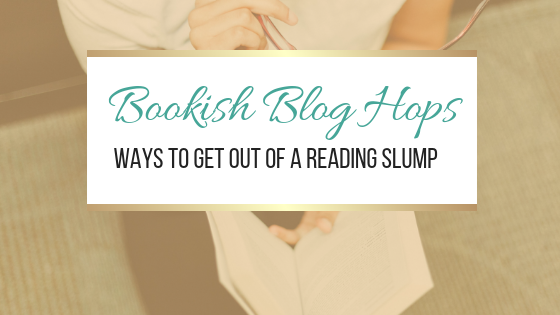 Hope you can use some of these suggestions should you hit another reading slump. I am gonna bookmark this for the next time I get stuck with a slump, which seems to be happening too many times recently. 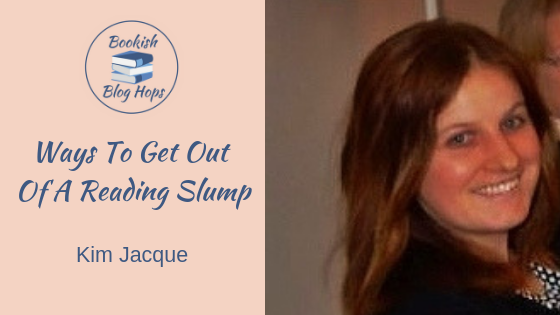 Great post and tips to get out of a book slump, Happy blog hopping and thank you so much for sharing your awesome post Jo. Thanks. Blog hops are loads of fun and a great way to get to know other book bloggers better. Glad you liked the post. I'm down for a Heather Graham Read-a-thon at the moment... my wonderful husband just bought me the ENTIRE 22 book Krewe of Hunters set. 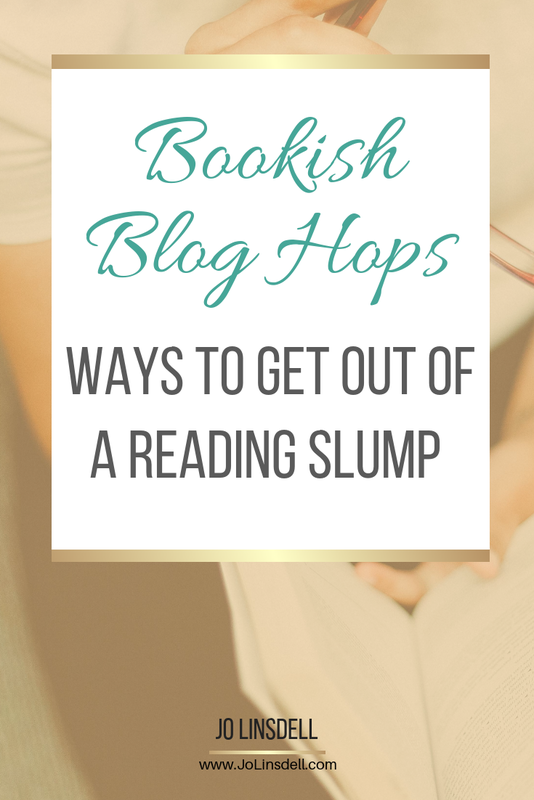 Get in a slump, try reading those! Haha an author slump. That's a new one on me ;) I need to read more Heather Graham. Enjoy your book set. That should keep you busy for a while.